In the world of the mighty monohulled superyacht, length overall (LOA in yachting terminology) has always been king. However, buying a yacht for its length is like purchasing a Bugatti Chiron for its ridiculous horsepower; it’s there, it can be used, but you don’t really need it. Sunreef’s Supreme 68 does away with the pomp, circumstance and pretentiousness of the megayacht. Instead, this 20-meter long catamaran takes the best parts of its considerably larger ocean going cousins to create what is essentially, a floating superyacht main salon, flybridge and foredeck lounge. Conceptualised and realized at Sunreef’s historic Gdansk shipyard, this Sunreef Supreme 68 is like nothing else on the water. From the off, she was built to cosset, pamper and entertain, combining an honest and modest exterior style with 3200 ft2 of custom-designed living space. With her straightforward layout and concentrated formula, Sunreef’s designers have been able to focus on four main areas: the main salon, cabins, foredeck and flybridge, completing each to perfection. With the main salon’s curtains closed, spending anymore than a couple of minutes lounging on the large sofa will have you completely forgetting you’re floating on the water. It’s only when the curtains are opened that you’re reminded exactly where you are, and with the 68’s fully folding cockpit and side doors, you get full connection with the sea. Whether you’re at the port side bar, or taking breakfast at the 8-seater dining table, you’re only a step or two away from the ocean. Thanks to her broad catamaran design, the Supreme has a colossal beam (max width) of 10.5 meters. It’s a mind boggling amount of space for a 68-foot vessel and the Supreme even manages to combine a garage/beach club aft – unheard of in catamaran terms, as normally, the tender is mounted at the transom. During the day the huge front terrace becomes the Supreme’s focal point, mixing acres of lounging space, with the natural privacy of the foredeck. With such a wide beam, loose furniture can be placed anywhere on deck, creating a layout of your choice. Again, for the on board sun worshippers, the Sunreef’s flybridge, with its six huge sunpads, is the perfect spot for working on that tan. Located forward of the helm, these beds are totally open to the sun’s rays, and with nothing but endless ocean and sky in front, you’ll have to be quick to reserve your spot. Behind the helm, a C-shaped sofa surrounds a fixed table and is serviced by a starboard side bar. As there is more than enough open area for absorbing some vitamin D, the lounge is thankfully covered by a large T-top. 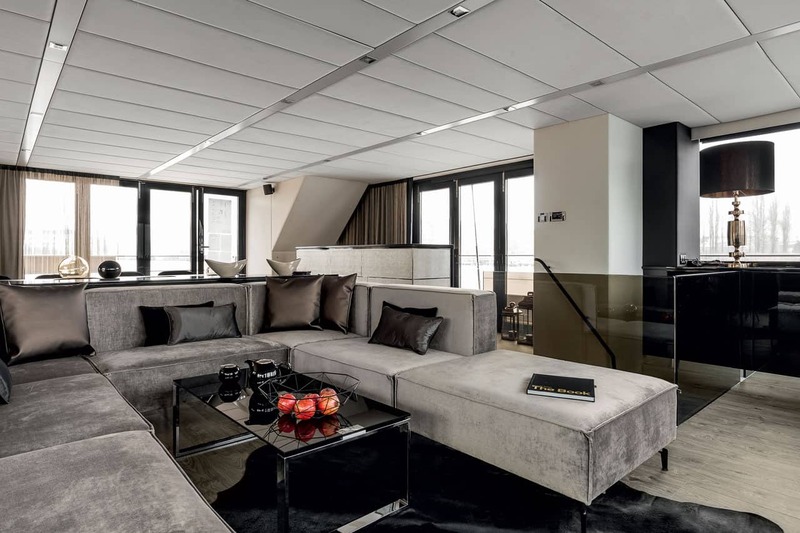 Even so, tinted panels in the roof let in plenty of natural light, with the T-top’s arch thoughtfully located behind the sofa, leaving an unobstructed view forward and out the sides. 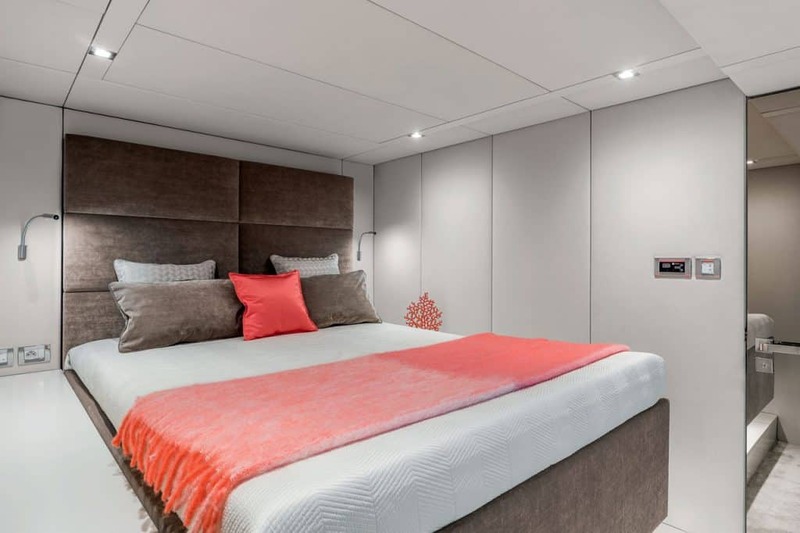 With an overall design honed for sea-air living, guests will most likely only use the cabins for freshening up, changing into their swimwear, or sleeping. 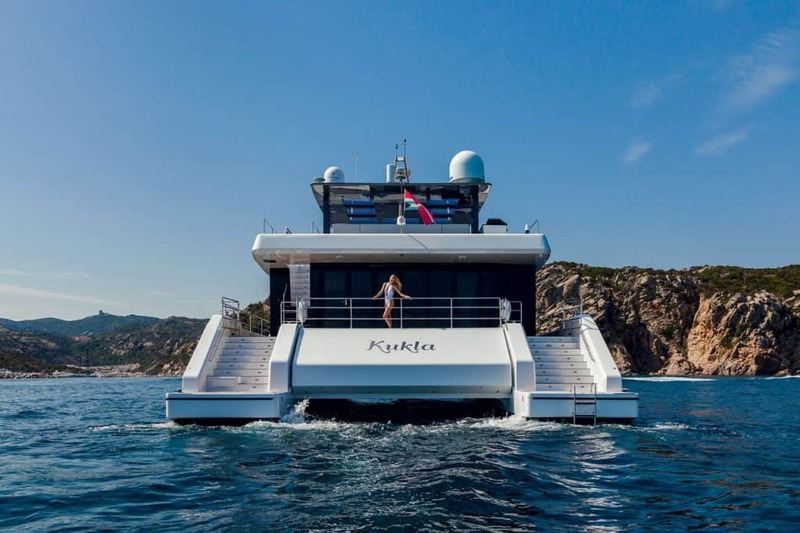 There are three VIP cabins and one Master suite housed in the 68’s ample hulls, with all four retreats following Sunreef’s iconic layout of having the King size bed facing the sea. There’s nothing quite as spiritual as waking up to the ocean outside your cabin window and on the Supreme, you don’t even have to raise your head from the pillow. Each of the cabins is on suite, with the Master featuring a larger bathroom with an extended walk-in closet. What the 68 does do, is offer all the trappings of a scaled down superyacht, without the waste of space. At only 20-meters long, the cabins, the main salon, foredeck and flybridge can be reached in seconds. This is a huge draw for an owner with a family, as the kids will never be more than a few steps away and with such a versatile design and comforting ambience, chances are the 68 may well become an integral part of the family.